Computer vision syndrome (CVS) is defined as the complex of eye, vision and body problems associated with excessive computer use. Most parents are rightly concerned about the types of people or subject matter that their children and teenagers might encountering online, but few of them worry about the effects of heavy computer usage itself. When personal computers were first designed and built, not much time or energy was spent on making them comfortable for humans to use. As more and more people began to use them for both work and play, eyecare practitioners noticed that many of their patients presented with certain symptoms and signs such as itching, burning, heaviness around the eyes, back and neck problems, fatigue and headaches. It wasn’t long before CVS became a topic of discussion and interest in academic circles as well. Recently, there has been a major shift in how computers are configured, with fewer tower-monitor-keyboard workstations and more laptops, as well as computing via smart phones, tablets and other similar devices. Whether adults and children are using tower-type PCs or laptops, some attention should be paid to the ergonomics of the situation; ergonomics is the study of how the human body works and designing technology to conform to it, rather than making the body conform to workstations that put stress on both posture and vision. Adults, children and teenagers alike all can experience eyestrain from trying to focus on a computer screen for several hours a day; children and teenagers, however, are still developing their visual systems, making them more vulnerable to long-term damage than adults. Over their lifetimes, children will be using computers and other digital devices much more than the typical adult. The hours of computer use by children and teenagers that have never known a world without them will add up to years by the time they reach the age of their grandparents. And this doesn’t even count time spent playing video games. By paying attention to how the body can be stressed by a workstation that isn’t correct for the user pays off by avoiding back and neck injury and reducing computer vision syndrome. Recent research shows that the incidence of myopia (nearsightedness) in some areas of Asia, where high academic performance and long hours at the computer are strongly encouraged, is nearly universal. Some studies report that nearly 95% of college and graduate students will develop myopia. Over a lifetime, vision correction costs for spectacles and/or contact lenses will add up to a large fortune, even without considering the costs of treating back and neck injury. Luckily, the improved clarity of computer monitors has somewhat decreased the amount of effort needed by the vision system to keep the screen clear, but the sheer number of hours spent gazing at a target that requires constant focusing accommodation is still problematic. When we are concentrating on work or a video game using a computer, the rate of blinking drops; straight-ahead gaze also decreases the rate of tear production as well. This is a double-whammy effect that results in symptoms of dry eye, including redness, burning, grittiness and reflex tearing from irritation. Computer vision syndrome is a significant issue, not just in Asia but in Canada and the US. Children and teens don’t understand the situation, and can spend hours in front of a computer without realizing the possible damage it can cause. Young people are still developing physically and are more susceptible to the demands a computer makes on the visual system and the body. They assume that any discomfort they may experience is normal, that everyone sees the way they do. Signs and symptoms of CVS often go unreported. Teenagers and younger children are smaller than adults. This might seem obvious, but when a workstation or computer desk is set up and arranged for the use of an adult, with adult-sized arms, legs and height, kids using the same computer without adjustment for their smaller size can cause problems, both visual and physical. The sheer volume of usage children and teenagers can accumulate, not just from computers, but video games, tablets, digital readers, smart phones and texting contribute. The portability of electronics makes them available to use anywhere and everywhere. Because they are experiencing rapid growth and changing bodies, young people need vision examinations more frequently than most healthy adults. Optometrists recommend yearly checkups, but they should be seen earlier if the child displays any symptoms or signs of visual distress. An uncorrected refractive error such as hyperopia (farsightedness) or astigmatism can contribute to visual stress; sometimes, a prescription for low-power reading lenses can reduce near-vision stress and help prevent unwanted adaptations to the visual system. 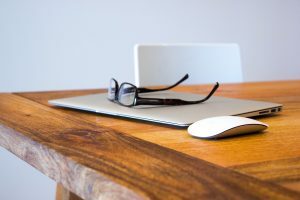 Even when a refractive error is present and corrected with eyeglasses or contact lenses, it may be necessary to use different corrective lenses for time spent on the computer. Another issue is how the eyes work together as a team in focusing, tracking and aiming. A thorough vision exam should include testing for all of these issues. Children should be required to take short breaks every 30 minutes or so, stretching muscles and refocusing the eyes out a window to reset their eyes to see in the distance. Workstations need to be adjustable, so it can be changed easily to fit their arms, legs and height. These guidelines from the US Department of Labor, Occupational Safety and Health Administration (OSHA) will help avoid the physical and visual stress that can be associated with prolonged computer use. The head and neck should be upright and aligned with the spine, not bent down or tilted back to see the screen. The computer screen should be directly in front of the eyes, not off to one side, which avoids neck and back twisting. Elbows should be comfortably close to the body, not out to the sides or cramped in too tightly. The chair should provide support for the lower back. It should also have a seat cushion with a contoured front edge so the backs of the legs are comfortable. The mouse should be close to the keyboard within easy reach. Support the arm and wrist operating the mouse so they are parallel to the floor. The top of the monitor should be at or slightly below eye level, so the eyes will be aimed slightly downward. This allows better tear flow and keeps the neck straight. Avoid reflections from the lighting on the screen. Lighting should be aimed at the hands and keyboard/mouse, not the screen or the eyes. The screen should be close enough for text to be readable without strain or leaning forward. If working from paper documents, use a holder to position them at the same distance and direction as the screen. Use a hands-free headset when telephoning while working. The speaker-phone is another option, unless privacy is an issue. Taking the time to make sure that children and teens are comfortable and causing themselves physical stress as well as eyestrain from a computer is important and will help avoid future problems. Make it part of the routine when anyone sits down to use a computer that they adjust the workstation properly, even in the case of just sitting down “for a minute or so;” as we all know, “just a minute” turns into an hour or more without any realization of time passing. Adjusting a workspace so that it fits the user can be thought of in the same kind of way we think about using seat belts in the car: it’s necessary and prevents harm. This might seem extreme, but when considered in terms of the long-term damage that could be avoided, it isn’t unreasonable. Posted in Medical Eyecare and tagged Computer Vision Syndrome.